Fatboy Picnic Lounge – At the Beach!!! There is a penchant to be had for period films which depict a certain grandeur of dinning alfresco in some Imperial British mode de vie. Footmen, servants, elaborate table settings with the fine “camping” china and flatware; all set of course in what would today be improbable outdoor roomscapes replete with tenting, plush upholstered cushions, and of course oriental rugs. Though I long ago abandoned the misnomer of a term ‘oriental’ to describe the contemporary rug and carpet market, I use it today as it befits both the style of the times previously described (and which I would like to convey), and to be frank, the style of the ‘rug’ which I shall forthwith describe. Ladies and gentlemen, as the Summer season is now upon us and as days at the beach occupy our leisure hours, I present the Fatboy Picnic Lounge – sur la plage. If memory serves me correct, I believe I literally let out an audible ‘Gasp! !’ when I first saw the Picnic Lounge from Fatboy. How? Seriously how could I resist? 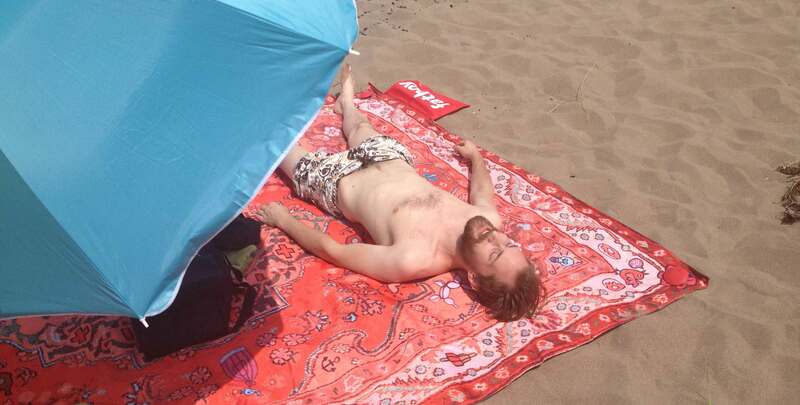 It was and is as though someone had designed a mass produced beach blanket specifically for the rug snob in me. And while my reputation for eschewing the pedestrian and (very) mass produced precedes me with almost reckless abandon, so too does my love of the irreverent and unorthodox. Thankfully for those at Fatboy their rug, err, blanket falls squarely in the later, thus avoiding what could have possibly been the second awarding of ‘The Ghastly‘. 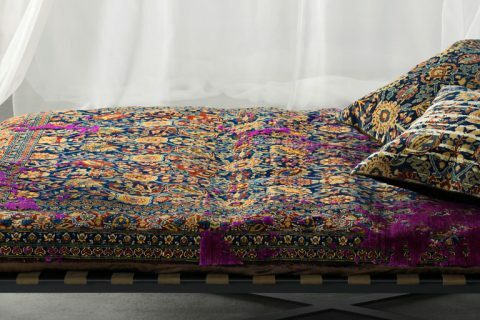 While I doubt whomever* designed this blanket is well schooled in the history of traditional Persian rug design, they do have an eye for mimicry and the design sensibility to compose a product so well designed, so irreverent – yet still honouring of traditional rug design, as to warrant unqualified praise and adulation. I tip my hat to whomever cobbled this design together and say that it is my honour not only to be talking about this fine work, but also to own it. 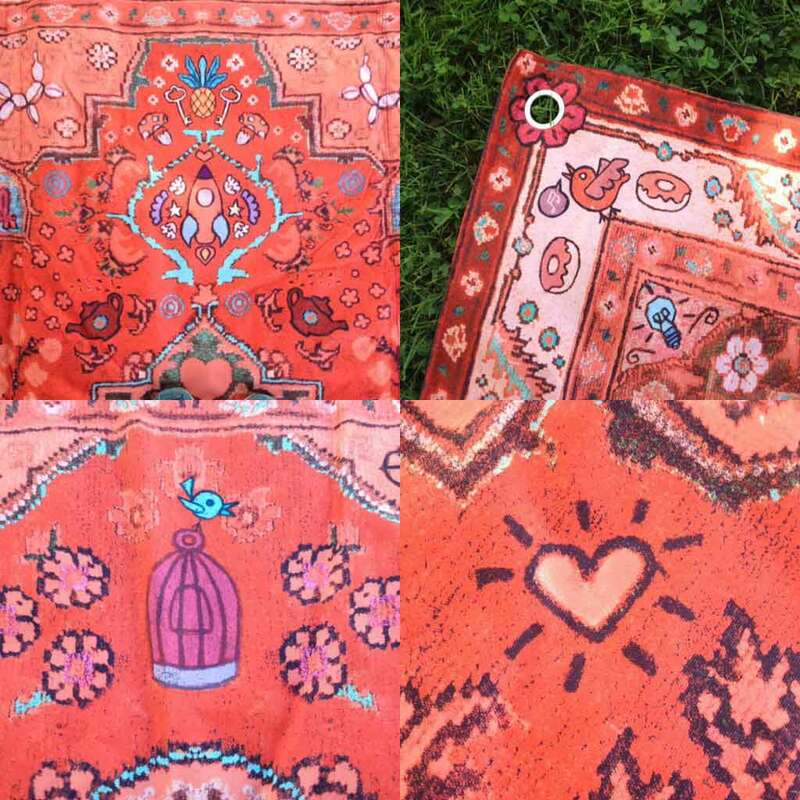 I ‘heart’ this blanket because overall it is an irreverent interpretation of a traditional Kashamahalahan (not an actual rug design). The Purists amongst us may revolt and scream bastardization and while the screaming is unwarranted we should be polite and acknowledge that should this design have been attempted as a handknotted carpet my praise and adulation would (as an understatement) not have been so forthcoming. The beauty of this piece, as it often does, lies in the juxtaposition and purpose. It’s intended to be used outdoors and on the beach. 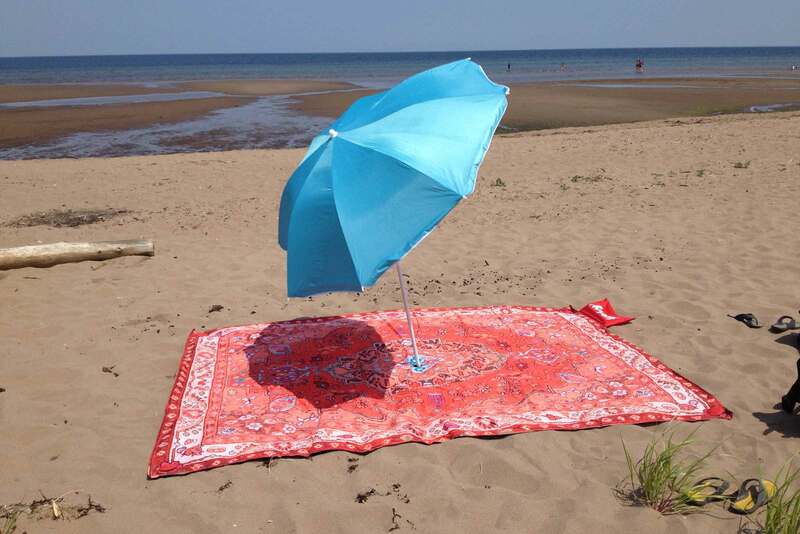 Modern practicalities necessitated by a lack of footmen and servants and the annoyance of removing sand from carpet pile give this beach blanket the competitive advantage over an authentic (whatever that means) handmade rug. 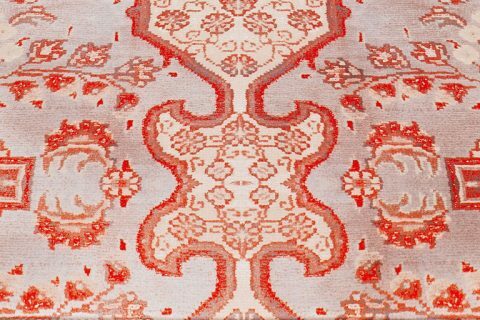 Mildly satirical comments aside, the fun and lively motifs used in this rug only become apparent on close examination, whereas when viewed from afar the effect is indeed one of that aforementioned imperial grandeur. As Fred Armisen would say in an episode of ‘Portlandia’: ‘Put a bird on it.’ My thorough but not necessarily complete examination of the various comical and whimsical motifs used in this blanket reveals that the designer was casting a wide net in his or her attempt to make the blanket as appealing to as many demographics (within the admittedly eccentric group that would purchase this) as possible. There is the obvious nod to the popular and trendy hipster crowd: Birds, Skulls, Moustaches, and Donuts but to name a few. Then we have the more time honoured motifs such as the Pineapple, Keys, Heart, and Teapot, while nostalgia reigns with with the Rocketship, Campfire, and Pocketwatch. Finally, there is (of course) the self-referential Balloon Dog in reference to a microbevy of other products made by Fatboy that I shan’t name lest this article appear sponsored, which it is not. All of these elements, set upon a traditional orange-red field with cream border, contribute to an overall pleasing design that is familiar and grand at a distance, yet surprising and uplifting in propinquity. Overall I am pleased with this fine blanket though it does have a few flaws which are thankfully confined to the included accessories and not the blanket itself. Firstly, the spikes used to anchor the blanket to the ground have already experienced some slight fading after but one use on the beach. Tsk, tsk, Fatboy they should be UV resistant. Secondly, the brush (which is most useful for removing sand), made of red painted wood, is already showing wear on the edges and deformed bristles. Again after but one use. If I were making up an arbitrary rating scale from one (1) to ten (10) I would give it an overall score of say 9.53426. So if your persona has style, sophistication, and dramatic flair for standing out in a crowd, the Fatboy Picnic Lounge may be for you, just don’t come to the same beach as me! *It should be noted that The Ruggist contacted the marketing department of Fatboy on 3 May 2015 for comment and received no reply. EDITORS NOTE: Since the publishing date of this article, The Ruggist has been in contact with Fatboy USA and had the pleasure of speaking with its President and CEO. 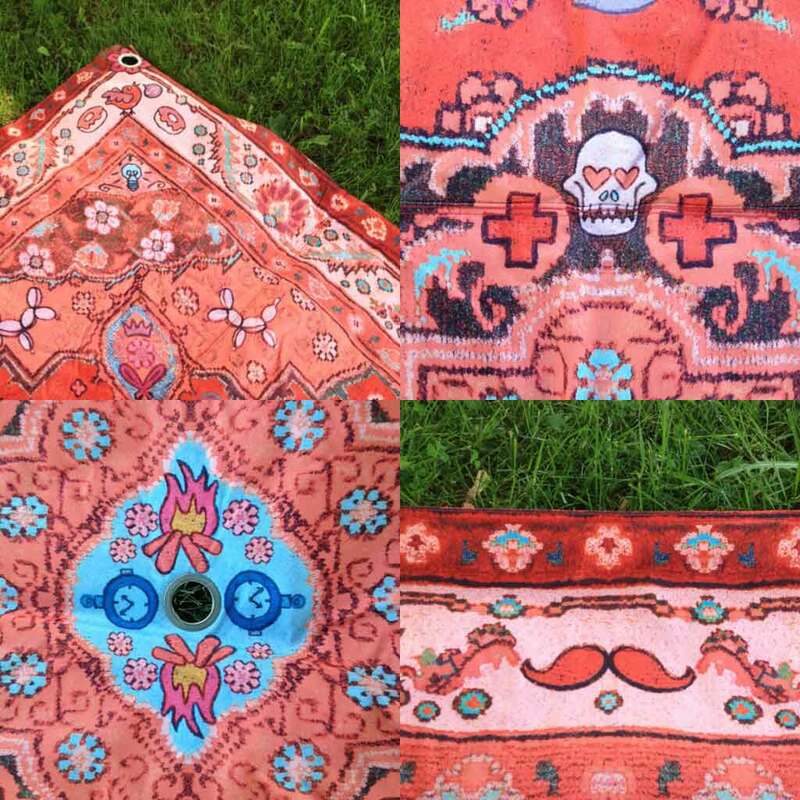 A discussion with Fatboy Picnic Lounge designer Paul Roeters and rug retailer Paige Albright.